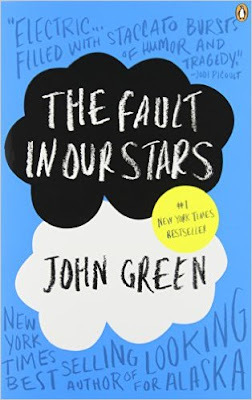 The July selection for the Inspired by Reading Book Club is a book written by one of my favorite young adult authors... it's The Fault in Our Stars by John Green. I feel more than a bit guilty admitting this, but I didn't reread the book this month. In my defense, I have read the book twice before and watched the movie within the last six months. I just couldn't bring myself to commit to the cry-fest that I knew would result from another reading right now! (Seriously, you will need the Kleenex box for this one... you have been warned.) The book tells the story of teenagers Hazel Lancaster and Augustus Waters from their first meeting in a cancer support group through their blossoming relationship. As usual, I'm not going to give too much away about the plot... but two kids who've had cancer falling in love, what could go wrong? I'll just say that John really captures something special and real here. As a bit of an aside, if you haven't read John Green's books, get yourself to the library or a bookstore! Looking for Alaska, John's debut novel, is still one of my favorite bookss (it delivers a major emotional punch in the gut that stays with you); An Abundance of Katherines (a book which I had the pleasure of being on the committee that named it a Printz Honor Award winner) is a more light hearted book with great humor. When The Fault in Our Stars was announced as his next novel, John also proclaimed that he would personally be signing every single copy of the 150,000 first edition print run. (I suspect that mid way through his signing jag, he may have regretted that decision but fans loved it!!) I had a fun encounter with a couple of teen girls at our local bookstore who were discussing what color ink each of their pre-order copies were signed in and generally gushing over John Green and his books. We got to talking and I told them that I had the pleasure of sitting next to him when the folks from Penguin took our committee out to lunch to celebrate his award and they pretty much freaked out. It's not too often that librarians get to feel a little like rock stars, so the memory sticks with me. Another confession, since I didn't re-read the book I made Eric give me ideas of inspirational jumping off points. (Yes, I AM a big cheating cheater this month!) One of the things he mentioned to me the scene where Hazel and Augustus were having their fancy and romantic dinner in Amsterdam and they are served champagne. Their waiter tells them what Dom Perignon said after inventing champagne... "Come quickly, I am tasting the stars." 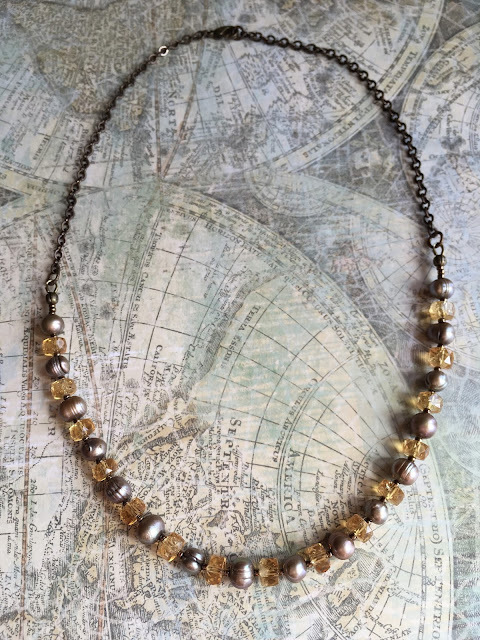 I had a mixed strand of faceted citrine and freshwater pearls that reminded me of the colors of champagne. I kept it pretty straightforward and just added seed beads in between and attached brass chain at the back. The picture is a tad dark, but hopefully you can get the general idea! I also made a bracelet using the macrame techniques I learned from Erin Siegel on the Bead Cruise a couple of years ago. I used a star shaped charm from Diana Ptaszynski of Suburban Girl Studio as a button clasp combined with new jade and aventurine. I hadn't decided if I was going to add any small beads to the ends of the waxed Irish linen or not when I snapped this picture during a brief moment of sunlight yesterday. In the end, I decided to keep it simple and trim the ends fairly short. No special symbolism here... just playing off the "stars" in the title. If you are interested in seeing what the other book club members made or want to join in the fun yourself, check out our Inspired by Reading Book Club Facebook page HERE. Thanks for stopping by! 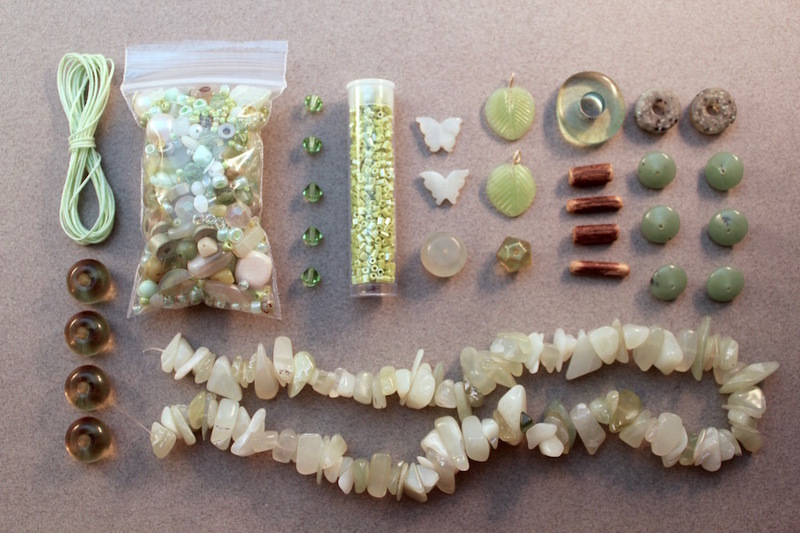 This year, my husband Eric has decided to issue me a design challenge each month to get me out of my comfort zone and to help clear out my bead stash... we're calling it the Honey Do List. I know that I'm not the only one who loves a good design challenge, so I'm inviting folks to play along! I'm a huge fan of the beauty to be found in nature, especially that hidden within the depths of the earth. The random patterns of these stone pendants are a work of art unto themselves--some abstract, others more defined. The challenge this month is to incorporate such a patterned natural stone into your jewelry! I'm sure that Eric was thinking about all the gemstone pairs and pendants that he helped pick out at Bead & Button when he chose this challenge! Here is a shot of some of those goodies. Even though I strongly suspected that Eric most wanted me to make use of some of my new pendants, I was in an earring mood when I started working on this month's Honey Do List so I started with some of the fun earring pairs. 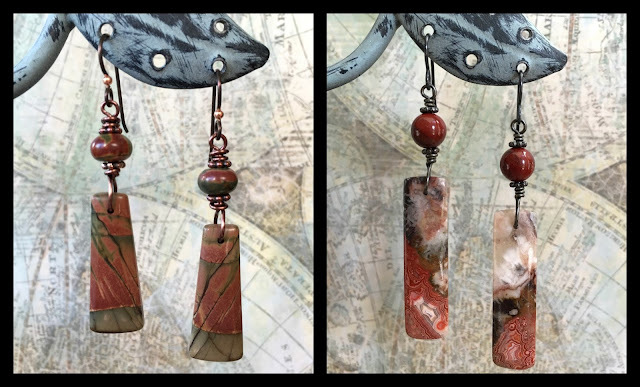 I made one pair with red creek jasper (left) and one with a combination of galaxy jasper and apple jasper rounds (right). I wanted to do at least one necklace for this challenge... 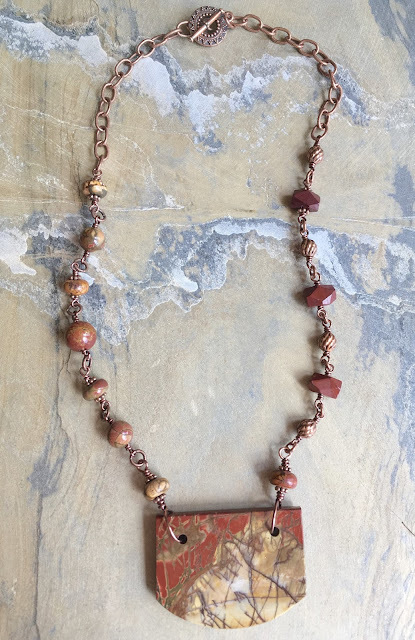 I chose a large red creek jasper pendant for my focal. Seriously, this is a statement piece! 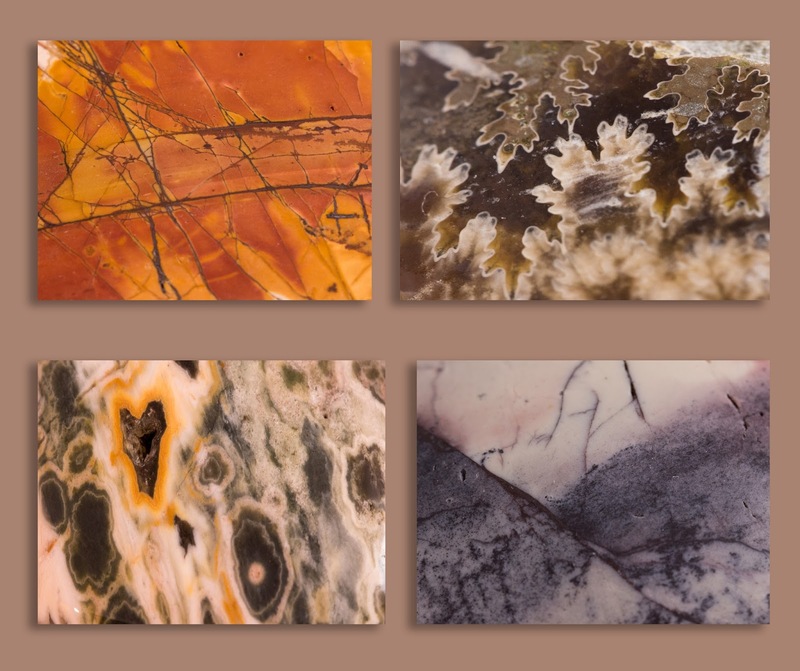 Red creek jasper is one of my favorite stones... so many great colors and patterns... Yum! My biggest challenge for this piece was the wire wraps for the pendant. (I'm jealous of folks who make that seem so effortless!) 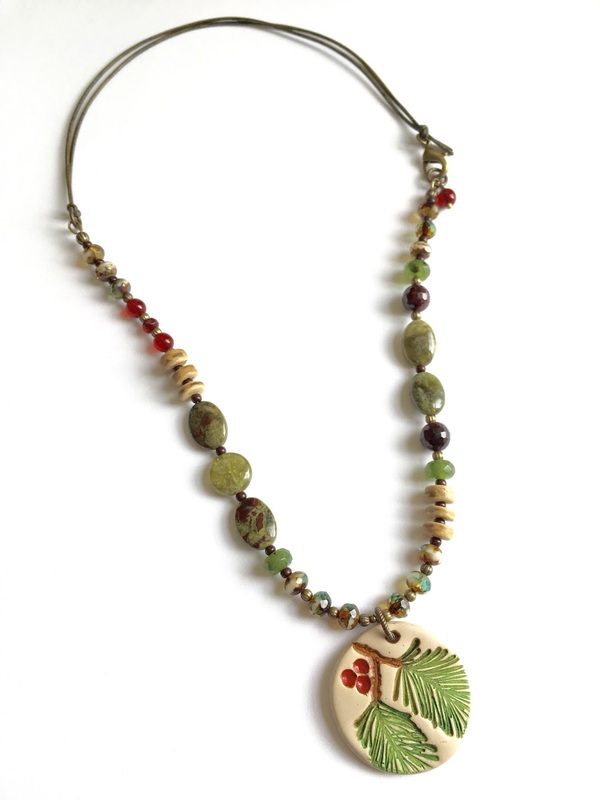 For the left side of the necklace I chose red creek jasper in a variety of sizes and shapes. The right side features copper beads and some abreciated jasper nuggets. 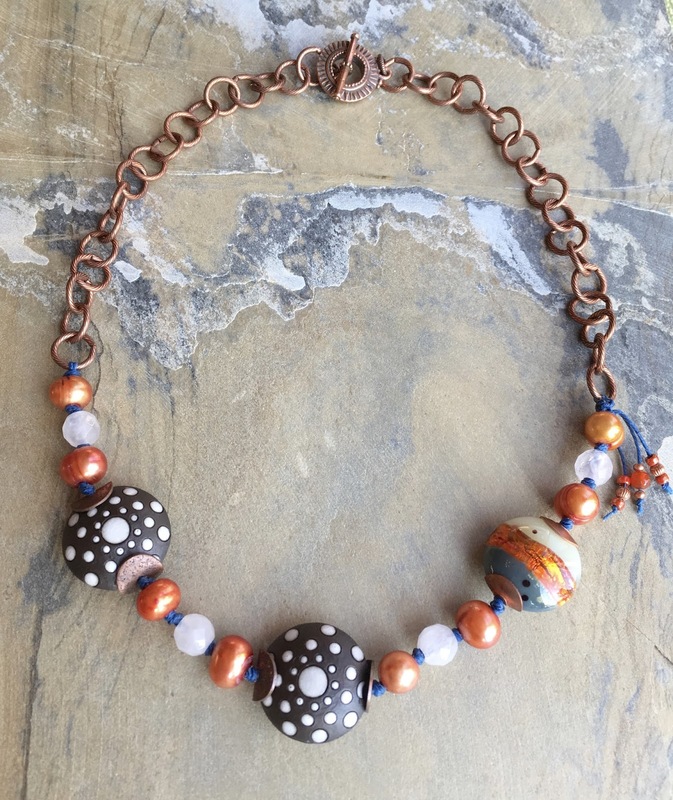 I didn't make this last necklace for this challenge (and I shared it in an earlier post) but I think it works here too so I'm sharing again! I haven't gotten in on too many of the Allegory Gallery design challenges since Andrew started them back up, but when I saw the Luna Moth kit I had to pounce! Here are some of the goodies from the kit... not including the mystery component. I didn't leave myself nearly as much time to create as I meant to/should have, so this week has been a bit of a scramble to take better stock of the kit's contents (so many goodies hidden in the luxury bead blend!) and pull some creations together. 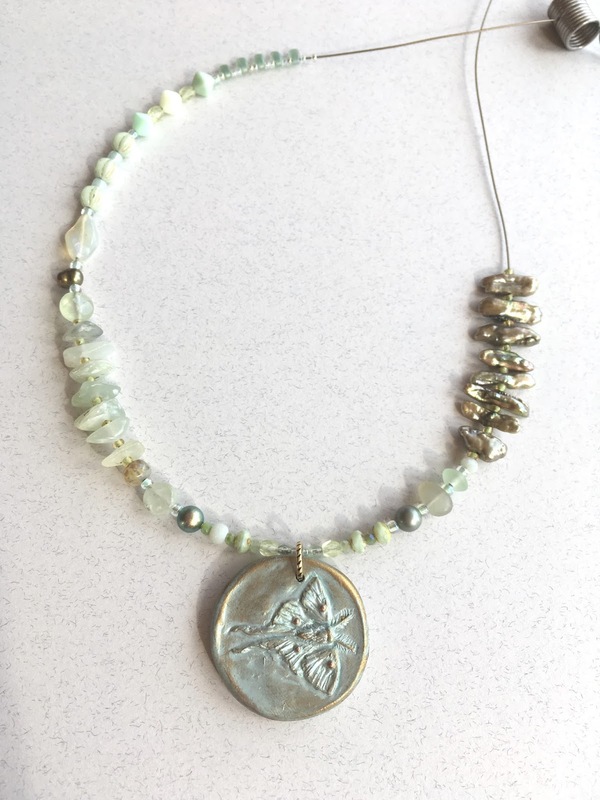 The next things that I pulled together was a necklace using one of the moths we made in Heather Powers' Luna Moth Metal Sketch class at Creative Camp. (Full disclosure: this is one of the ones that Eric made! Didn't he do a great job?) To add some visual weight and physical weight to the pendant, I chose a gemstone from the kit (new jade?) 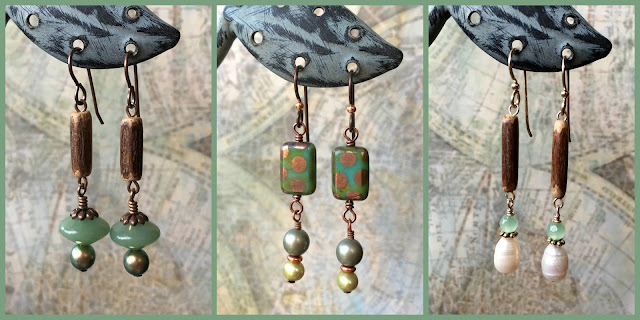 and wire wrapped it with a lovely green Swarovski pearl and some copper plated components. 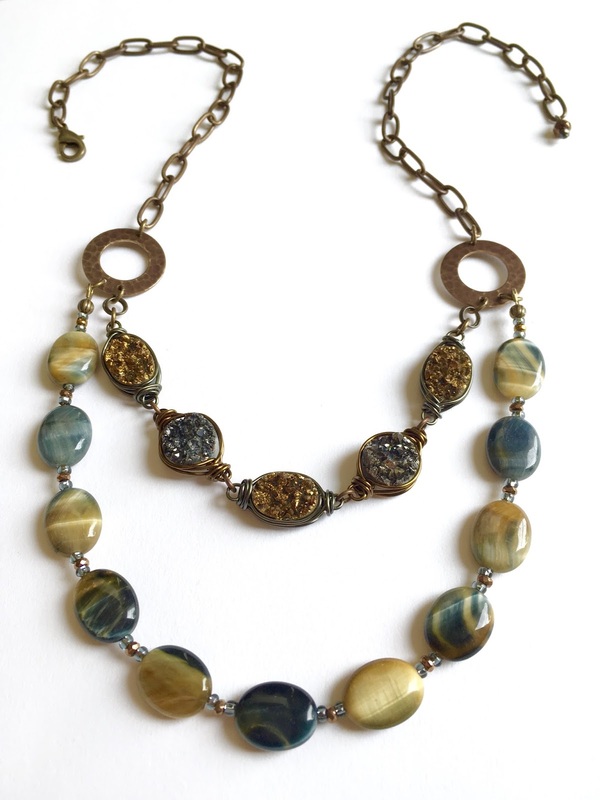 Once again, I mixed beads from the kit with some from my own stash using a combination of brass and copper findings. I'm kind of terrible about hoarding the mystery components from Andrew's kits because I want them for myself! 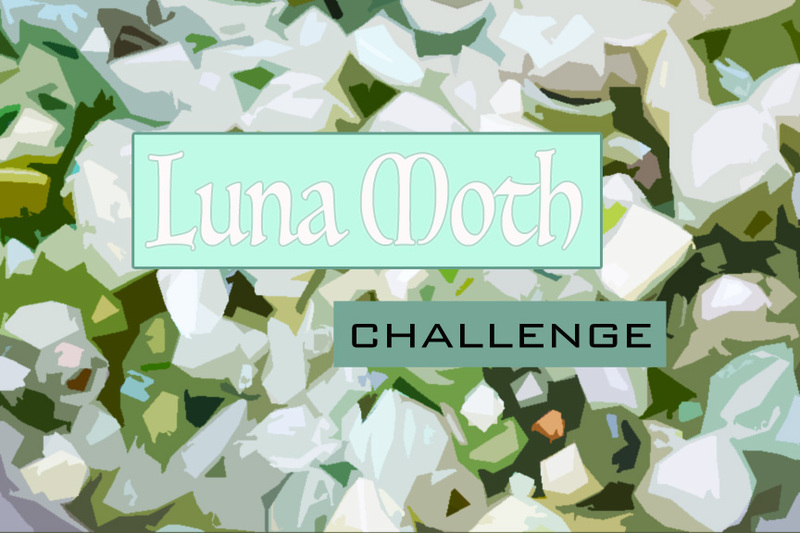 This time I was determined to actually use the gorgeous luna moth pendant that Andrew made for us... as you can see, I didn't quite get finished but I wanted to share the general direction I'm headed in anyways. I don't often work with gold tones but he green and gold sheen of the pendant cried out for it so I went for a gold plated jump ring. Eventually the necklace will have a gold plated twig clasp too. I've used a ton of beads from the kit this time and added in some great pearls I found on our trip to Portland. I'll be sure to share the completed design as soon as I get it finished! I still have tons of great stuff left over from this kit and more ideas rolling around my head than I had time to make. Maybe sometime soon I will do a follow up blog post with creations pulled together from all of the various design challenge kits I have. This past weekend my husband Eric and I travelled to the picturesque town of Ligonier, Pennsylvania for a weekend of jewelry making classes, friends, and fun. And, yes, Eric took the classes too... and he did awesome! (More on that in just a minute.) We added on a little time to the beginning of our trip to explore Pittsburgh and try many of its craft breweries. (This may have been a bribery technique on my part... don't judge!). Anyway, I thought I'd share a little bit about our adventures at Allegory Gallery's Creative Camp! If you don't already know, Allegory Gallery is a wonderful gallery and bead store in Ligonier, PA that is owned by Andrew Thornton and William Jones. Let me just tell you... those guys know how to put on a fun event and their shop has plenty of tempting goodies too! I know that Eric will eventually cover all our beer and cider stops over on his blog, so I'll stick mostly to the jewelry-focused portion of our trip. I will share one highlight of our stop in Pittsburgh... the National Aviary. 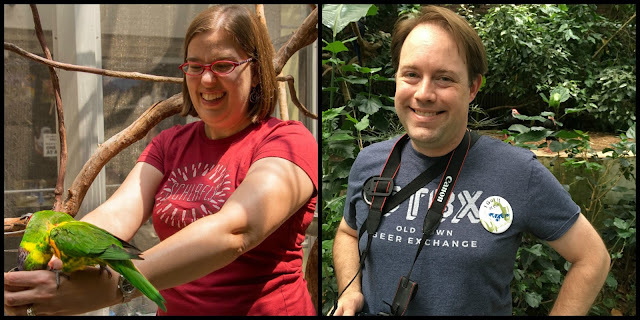 We were looking at possible destinations for Friday during the day and discovered that the Aviary was nearby and, as Minnesota Zoo Members, we were eligible for a discount. Score! We enjoyed a nice interlude exploring their fabulous exhibits. I even got to feed the lorikeets (and Eric got pooped on while photographing them)!! We got into Ligonier a little bit later on Friday than we originally planned so we checked into our hotel and made a bee line over to the Vendor Night event that was at a nearby hotel. I neglected to take any pictures that night, but I did pick up some fun new goodies including a bunch of new Humblebeads from Heather Powers. Eric even found an adorable baby Groot made by LES Polinko to adopt! After a yummy breakfast of crepes at our bed and breakfast, Eric and I were fortified and ready for our first class on Saturday morning. We both took Cynthia Thornton's Alchemical Bronze Medallion class... as an added bonus Andrew was teaching with his sister! 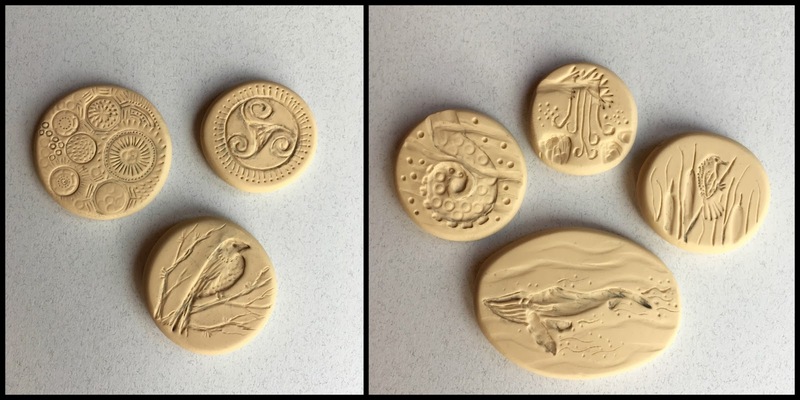 In this class we learned how to create our own reverse molds from polymer clay then press bronze metal clay into the molds to make our own medallions. Eric hard at work on his molds and Andrew moving our bronze clay pieces to the dehydrator. Since I've never been super artistic as far as making something that looks like something else, carving the molds was a little intimidating for me. On the other hand, Eric took to it like a duck to water and got some amazing results! 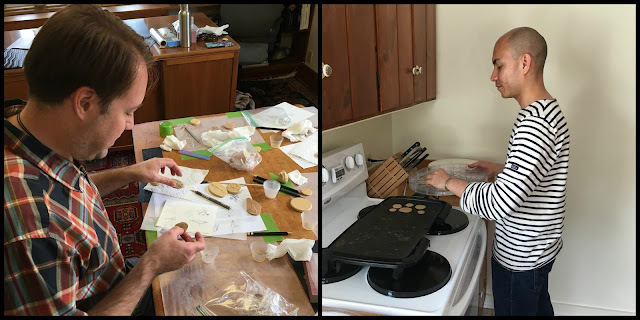 We both had fun with the process and went home with molds that we can use in the future with polymer clay, metal clay, etc. Since the metal clay has to be fired in a kiln and then tumbled, we will have to wait a little while to get our finished pieces in the mail. I'll make sure to share them when that happens! For now, behold the molds we made! Mine are on the left and Eric's on the right. 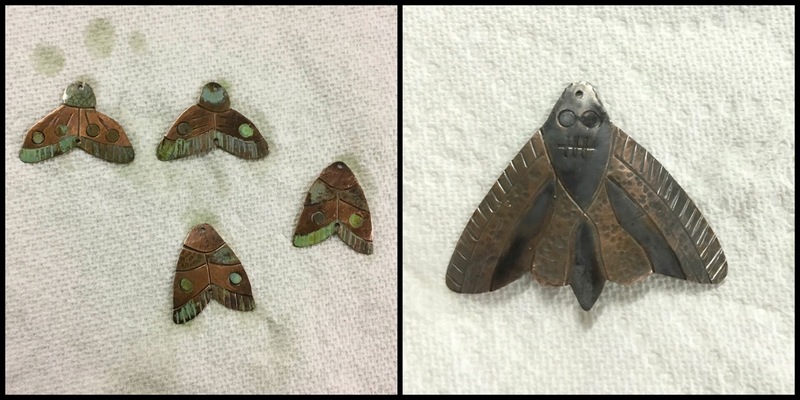 On Sunday we headed off for a day of cutting, filing, texturing, and coloring metal in Heather Powers' Luna Moth Metal Sketch class. Heather taught us her super cool Metal Sketching technique to give fun textures to the moth shapes that we cut out of copper sheet. (If you want to know more about the basic technique, check out her book Beautiful Elements.) To add the green color to the metal we used Swellegant patinas. This was my first time using true chemical patinas and I definitely would like to play with them more! I think this class gave Eric a much better appreciation of the work I do... his hands were super tired from all the filing by the end of the day! Maybe a new tumbler may be in my future to help with all those rough edges instead of needing so much filing. A girl can dream! Some of my completed moths; Eric (the overachiever) made an awesome Death's Head Moth! In addition to the classes, there were plenty of opportunities to socialize with the instructors and our fellow Creative Campers. We made new friends and saw old ones... ate, drank, and were merry. All in all it was a fun and productive weekend full of fun, learning, and some delightful surprises along the way. I want to give a HUGE shout out to Andrew, William, and all the instructors! It was a wonderful event! If you ever get the chance to visit Ligonier and take classes through Allegory Gallery, you won't regret it! For this month's inspiration for the We're All Ears challenge on the Earrings Everyday blog, Erin Prais-Hintz has chosen hot air balloons! 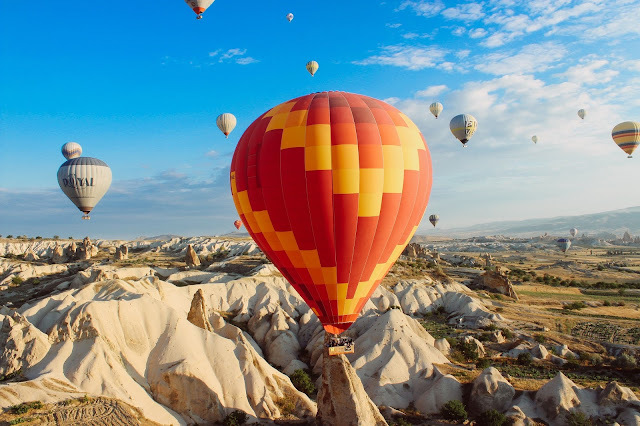 So much gorgeous color and fun patterns in balloons... I can't imagine what it would be like to see a big rally or other event with tons of balloons in the sky at once. So cool! Here is my favorite picture from the ones that Erin shared. See more over on Earrings Everyday HERE. I was a little stumped at first about what I wanted to do but then I realized that I had some orange ceramic beads from Golem Design Studio that had a corrugated design that made me think of the balloon material. 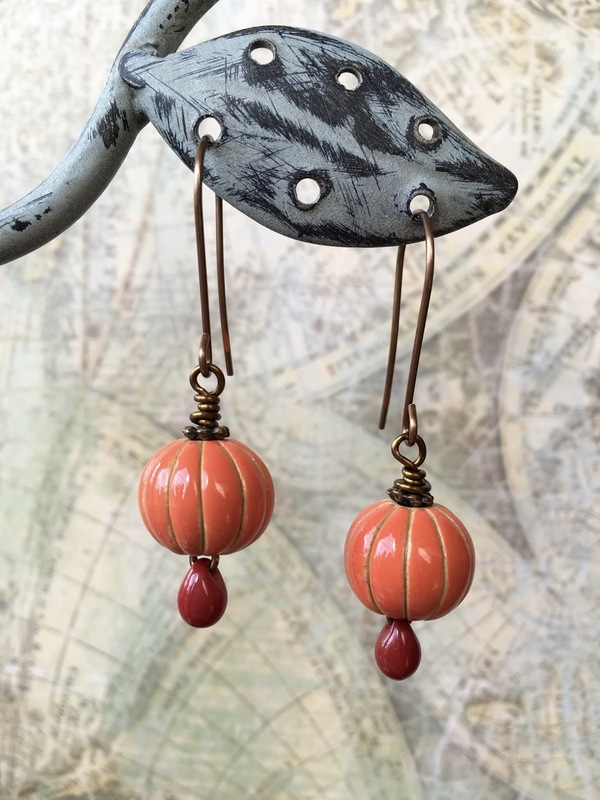 I also had some new dark red teardrop beads that I picked up at Bead & Button that I thought would be fun to dangle below the ceramic rounds like the balloon's basket. I originally thought I could just thread one onto a jump ring and have that hanging from the ceramic bead unit but I didn't have any that fit nicely through their holes without being too flimsy. On to plan B! I strung the teardrop onto some wire first then ran that wire up through the ceramic pieces and formed a wrapped loop at the top. Voila! Behold my hot air balloon earrings! Not earrings, but I'm sharing anyway... a few years ago I bought some fun hot air balloon shaped pendants from lampwork artist Wendy Mosman. (She doesn't seem to still be making beads from what I could find online.) I was captivated by their fun colors and details and just had to have them. Soon after I tried making a necklace with one of them, but when it didn't come together the way I'd hoped, I ended up scrapping and putting the pendants away for another day. Today is that day at least for one of them! 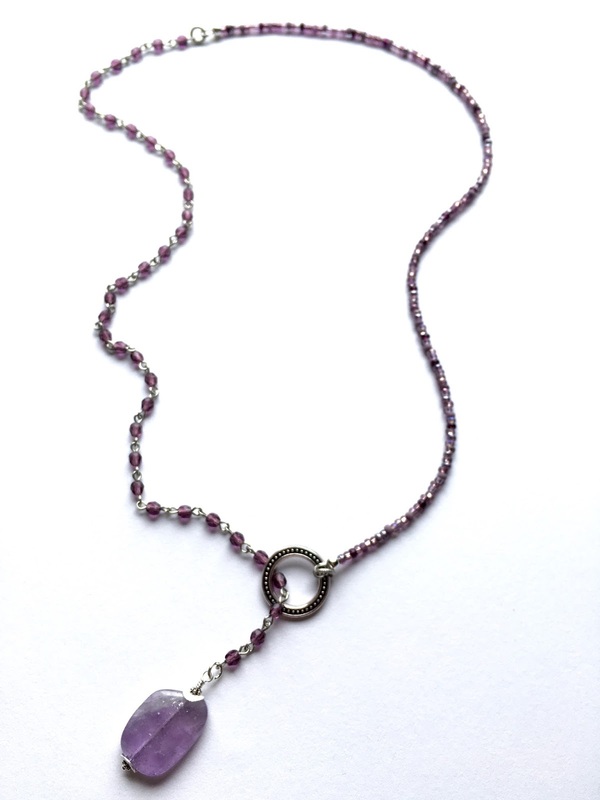 I strung a long necklace with a variety of recycled and Czech glass beads interspersed with seed beads. I'm pretty happy with the end result so perhaps I'll tackle the other two pendants soon. Another brief aside: a number of years ago I had the chance to go for a hot air balloon ride when I was at a conference in New Mexico. I'm so glad that I took advantage of this amazing opportunity. It was a pretty thrilling experience to see the world floating from above! The only part that was a little scary was the landing... it was a bit bumpy. 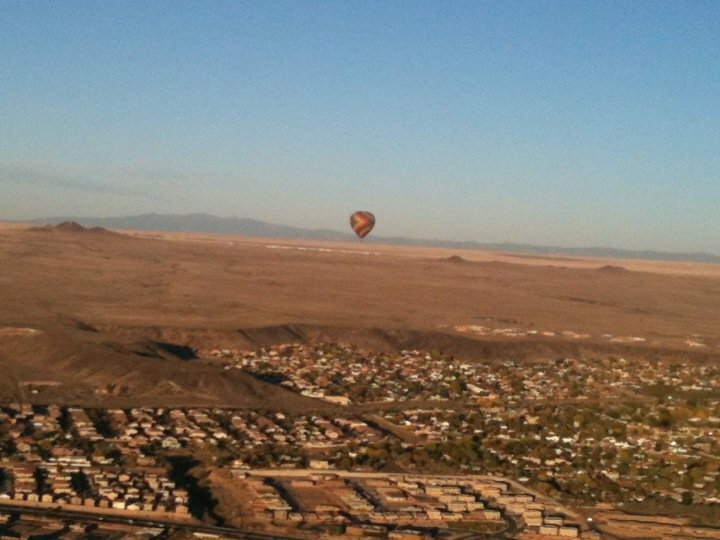 A picture I took from about 1000 feet above the ground of the other balloon carrying our group. This month's inspiration for the Art Bead Scene challenge is fitting for the month when we celebrate the Fourth of July as it depicts a display of fireworks! The image depicts pleasure boats on the Sumida River, with Ryogoku Bridge in the center. During summer and early fall, the Sumida River was the scene of a custom known as "taking in the cool of the evening." Fireworks were a big part of the festivities. You can read more about the artwork and the artist over on the ABS blog HERE. 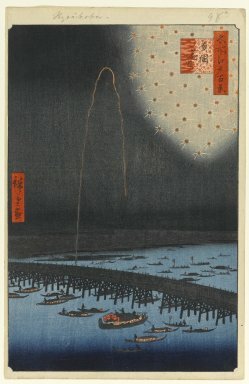 "Fireworks at Ryogoku (Ryogoku Hanabi)"
No. 98 from One Hundred Famous Views of Edo, 8th month of 1858. The first thing that I always do when I see the artwork for a new month's challenge is to go open all the drawers in my main art bead storage and see what I have that might fit the bill. I have to admit that there wasn't a whole lot that jumped out at me, but I did have one lovely lampwork glass bead from local artist Jeff Barber that had some promise. The colors were spot on with cream, bluish grey, and orange tones all shining through. The orange part even feels like the rectangles in the inspiration artwork! Once I had my starting point, it became a fairly quick process to find other beads and to pull everything into a cohesive design. I realized that I had some Golem Design Studio beads that reminded me a bit of the burst pattern of large fireworks. I had them in both dark red and white on chocolate clay. With the colors in the lampwork (and the inspiration artwork) I decided the white version looked best. Normally, I would have wire wrapped the lampwork bead and used it as a pendant, but once I found the Golem ceramics, I went off in a totally different direction! 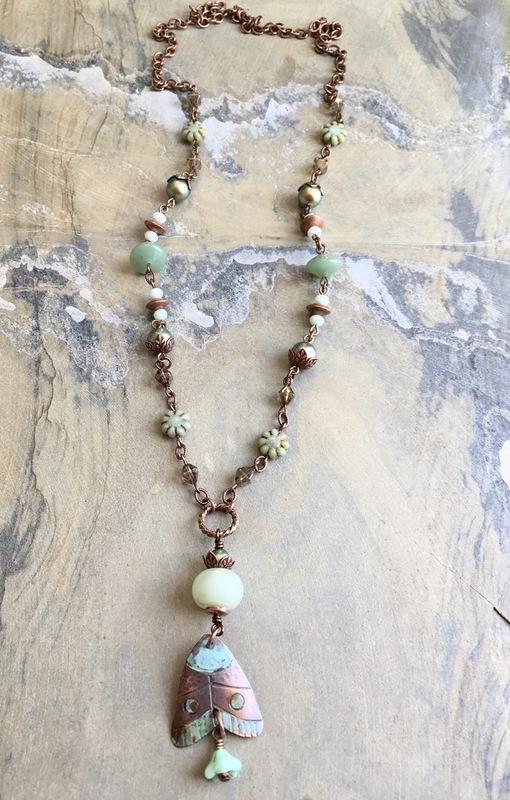 I added some large hole coppery colored pearls and rose quartz beads that looked more white to string with the art beads along blue waxed Irish linen. To continue with the orange and copper look of the necklace, I finished the back with copper plated chain and a sunburst pattern copper plated clasp. Since I bought a possibly ridiculous amount of this size Golem ceramic beads, I'm thrilled to have a new design idea for using them. I think you'll see some variations on this from me in the near future! I've really been trying to up my game when it comes to submitting projects for possible magazine publication this year. Part of that is keeping an eagle eye open for the new publication guidelines when they come out and making more of a concerted effort to design specifically for those guidelines. In many ways it's just like designing for any other challenge except that I can't blog about what I've made (until I know they don't want something)! The deadline for Jewelry Stringing magazine's Winter 2017 issue passed a couple of weeks ago and I've now heard back from them about which of my designs they would like to publish. I'm so thrilled that they are interested in publishing several of the pieces I submitted! I ended up sending them photos of seven necklaces, two bracelets, and three pairs of earrings... the most I've ever created for one issue... and it really paid off! You'll have to wait until early next year to see the designs that they chose, but I wanted to share the other pieces that I sent in now that I know they aren't in the running. If you aren't familiar with how Jewelry Stringing calls for submissions, they put out several categories for each issue and give a color palette or other prompts to get jewelry designers pointed in the right direction. Here are my unsuccessful submissions grouped by category along with the submission guidelines for each. Enjoy! This first necklace is one of my favorites that I made for this issue. I used a polymer clay pendant from Summer Wind Art that Eric bought me last Christmas with a varied mix of materials. 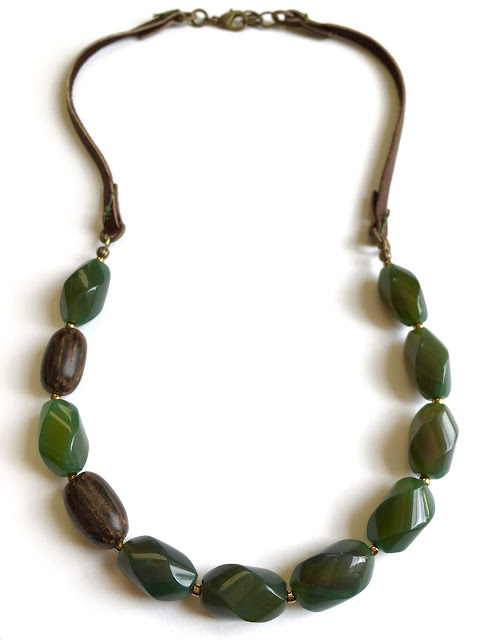 I combined green agate, jade, dragon's blood jasper, faceted garnet, Czech glass, coconut shell, and brass. I finished the back with some leather cording. I'm thrilled with the way this one turned out but I wonder if the addition of the dark red into the color palette was just a little too far out there. Next up, I made a variation of a necklace that I shared for the May Inspired by Reading Book Club. You can see that original design HERE. This time I used some green agate twisted barrels that I've probably had since 2008 with the wooden beads. I added an extra pop of green by using dark green waxed linen to tie the deerskin leather lace closed at the ends. I really wanted the gemstones to shine for this necklace. 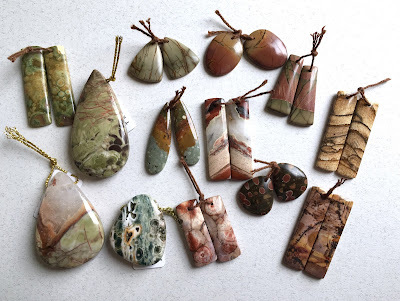 At the last local bead show I attended, I had bought a premium strand of large Rocky Mountain Picture Jasper pendants from Dakota Stones. They had a semi-matte finish and gorgeous colors. I didn't have much in my stash that really worked with them but luckily I found some things when I went to the Dakota Stones showroom sale! I picked up some matte Red Creek Jasper rounds and some Wild Horse Picture Jasper coins. Since my only copper crimp covers are bright copper (and coated so they won't darken in liver of sulfur! ), I attached a stack of small antiqued copper jump rings to cover my crimp beads and finished the back with copper plated chain. Full disclosure: this is the necklace that I am most proud of in this round of submissions and the one that I'm actually sad that they didn't choose. 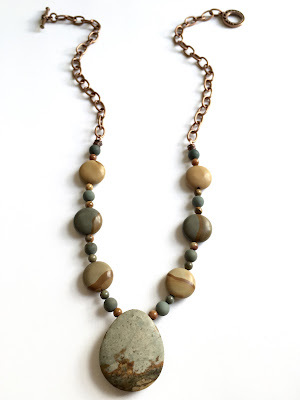 This is another case where I actually shopped for the perfect stones to use for this necklace. When I saw the gold and black druzy strands at the Dakota Stones showroom, I knew I wanted to use them for the Earth Form category even though those babies aren't cheap! Finding the strand of Blue Golden Eye ovals was like a lightning bolt to my brain telling me that they needed to be mixed into a two strand necklace with the druzys. It took a fair amount of playing with the strand lengths to get the wire wrapped druzys to play nice and I'm actually not sure it's totally there yet, but I'm so in love with the look! I'll keep playing and wear testing until I get it perfect. The last of the necklaces that I made for this issue was this lariat style necklace. This isn't a style that I usually make but I wanted to see if I could stretch myself and pull it off at the final hour before submissions were due. I picked up some beaded chain from Lima Beads (there was no way that I had the time or patience to make all those tiny links myself!) and used that for one side of the necklace and then strung a purple seed bead mix on the other. I anchored the look with an amethyst pendant. Most bracelets and earrings that the magazine editors accept end up in two page spreads that they call "galleries." 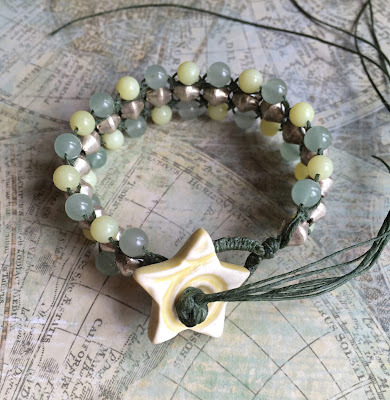 This time I sent them a couple of random bracelets that I had just made... they selected one and here is the other! 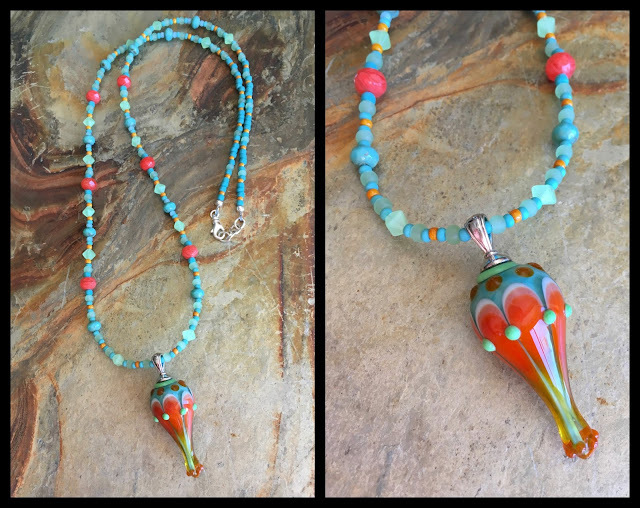 This is a slight variation on a design that I have done before but using a different size and shape Czech glass bead. 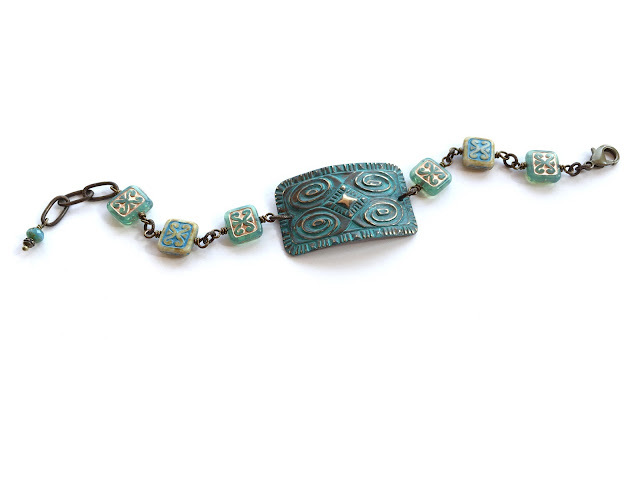 I painted and shaped the bracelet's focal and then added the wire-wrapped links. This bracelet will be at the July shopping event at Perfectly Random 2 in Lakeville July 7-10. Thanks for stopping by and checking out what I've been working on lately! Happy Fourth of July, everyone!! Sorry I'm running later than usual with this, but it's finally time to announce this month's Honey Do List Challenge! Close ups of some of the gemstone pendants that Eric helped pick out at Bead & Button! The reveal date will be Monday, July 25th. To make it super easy for you to participate and share your creations, I'll set up an Inlinkz link up so folks can add their blogs as they are ready. Just stop by my blog on July 25th and join the fun! I'll leave the link up open for a while... so you have plenty of time to add your links. (Last month's is still open... check it out HERE.) No blog? No worries! Feel free to send me a picture of your creation and some brief comments and I'll happily share in my blog post. You can reach me at sjdesignsjewelry@gmail.com The more the merrier, so I hope you'll play along with me this month! I hope that you all have a happy and safe holiday! I'm going to go get back to work!